The use of Commercial Earth Imaging Satellites is growing. 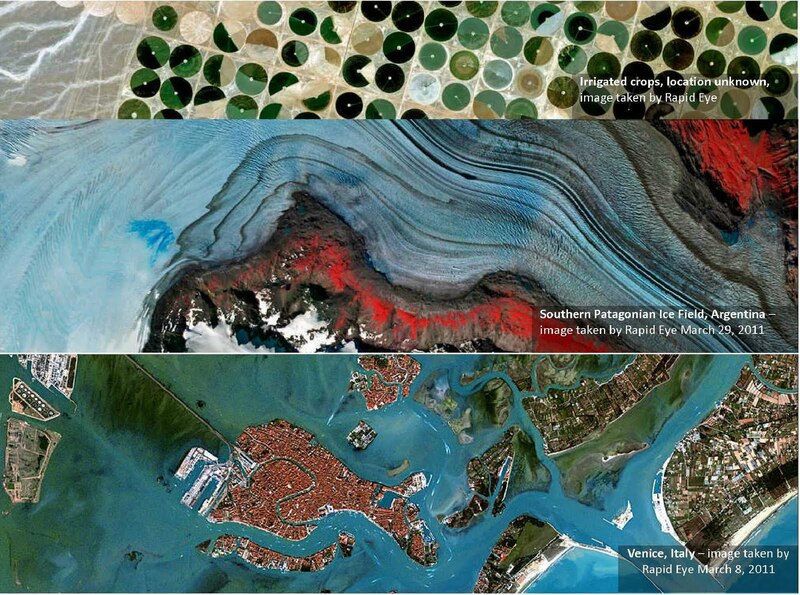 Individuals, corporations and governments are finding varied and unique applications for images of our planet. 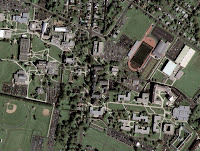 Futron estimates the market for commercial earth imaging topped $1B last year (2010). Disaster avoidance - George Clooney (among others) paying to patrol boarder of north and south Sudan using Earth imaging satellites. Even the US Government is turning to Commercial providers. 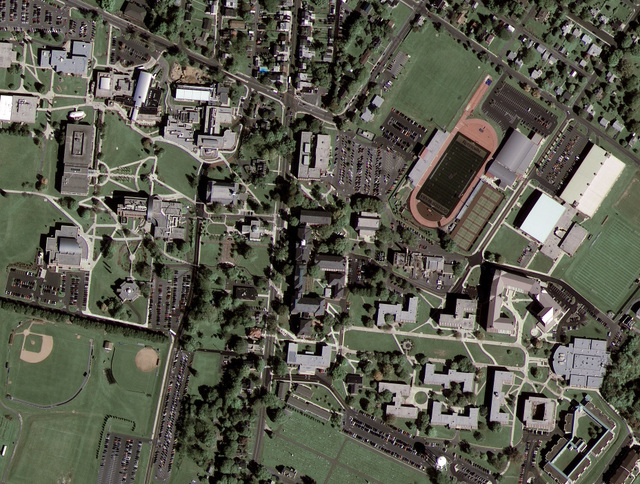 Last year, the U.S. National Geospatial-Intelligence Agency (NGA) awarded separate 10-year, $3.5 Billion contracts to image providers DigitalGlobe and GeoEye (these contracts are now under review). Market #1: High-Resolution images (1.5 meters per pixel). But the cost of each satellite means providers have a limited number of satellites (usually 1-2) on orbit. Market #2: Med-Resolution images (5-7 meters per pixel) – lower quality images, but providers tend to have more satellites in orbit and may offer more spectral bands to choose from for each image and offer more frequent photo opportunities due to the higher number of satellites within the constellation. 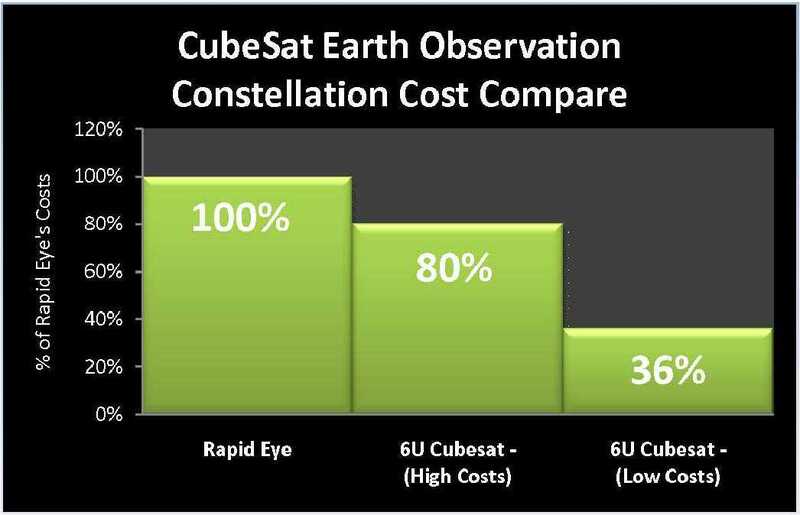 In a recent Nov 2010 paper, “6U CubeSat design for Earth observation with 6.5m GSD, five spectral bands and 14Mbps downlink,” author, Dr. Steven Tsitas outlines how a constellation of 6U CubeSats could serve Market #2 (frequent med-res images) competitively. (Sorry, I think you will have to buy the paper. If a reader finds a free version of the paper online, let me know and I will change the link). I hope to post an interview with Steven Tsitas soon. Rapid Eye, a German company, is the current leader serving Market #2. Below I will provide some details about Rapid Eye and how a CubeSat constellation might be able to compete with Rapid Eye. First, a little education about Rapid Eye. Once an order is placed for an image, can take a photo of any location on earth (between 75 degrees N and 75 degrees S) within 24 hours. So what if we could launch a constellation of ten cubesats that could perform a very similar function as Rapid Eye’s current constellation of five small sats? Are their savings if we could? For this post, I will use Steven Tsitas’s conclusions that, yes, such a cubesat constellation would be technically possible. I will build my business case, not from a technology discussion, but by attempting to answer the business question of - how much could an business save by using Cubesats instead of small sats? This would mean a CubeSat venture competing with Rapid Eye could theoretically lower image prices by twenty percentage points over competitors (all other things being equal). This by itself may close the business case for some CubeSat constellation investors. But perhaps competing toe-to-toe with Rapid Eye is the wrong business model. As a general rule, it is hard to out Wal-Mart, Wal-Mart. What-if the CubeSat earth imaging venture could, instead, become the low-price, no frills, earth imaging provider? In the earlier example, the CubeSat advantage was limited to lower satellite costs and cheaper rides to orbit on SpaceX launch vehicles. But what-if the venture could also save money on ground costs: Hardware/ground stations and operating expenses? Lower operating costs from $25M to $10M per year. Market price elasticity: How price sensitive is the earth imaging market? How would cutting Rapid Eye’s price by 20-60% affect demand for a CubeSat-based image product? What realistic cost reduction methods are possible in ground hardware and personnel? What are the cost implications from using a CubeSat-based system? Where are system costs reduced? Where are system costs increased? Admittedly, images from a CubeSat are of a lower quality than the best in orbit (5-7 meters per pixel compared to 1.5 meters per pixel from the industry leaders of market #1). How sensitive is the market to image quality? And what can be done to increase the quality of an image taken on a 6U CubeSat? The National Space Society posted last week about a new Law School text book that includes a chapter on space property rights written by Alan Wasser and the Space Settlement Institute. I first interviewed Alan Wasser a year ago and later built a business case on a lunar facility operating under Alan’s proposed land claims legislation. Q. For those that don’t know, what is "Land Claims Recognition" and how does it relate to space property rights? Alan Wasser: There is one very high value, zero volume product that already exists in space, just lying around waiting for us to exploit it: Real Estate. Land Claims Recognition would allow private Lunar settlements to claim some Lunar real estate and sell portions to people back on Earth, serving as a revenue source to fund private enterprise space settlement. No need to set up a factory in space, No need to mine it. No need to haul it back. Just land, set up a permanent settlement, claim it, and start selling the surrounding land to investors and speculators back on Earth to pay back the cost of developing affordable transport. The US government has now officially decided not to go back to the moon, philanthropists cannot afford it, and there is nothing else on the moon or Mars that could be profitable enough to justify the cost of private enterprise developing safe, reliable and affordable human transport. Therefore, Land Claims Recognition is now clearly the only way we are ever going to see a significant return to the moon, but this time to stay. Q. You provide a legal defense of these land claims. Talk to me about your efforts. Alan Wasser: Land Claims Recognition would allow individuals or companies to appropriate and sell lunar land, - but ONLY after they have already established a true permanent human settlement on the land they are claiming. It is the settlement, itself, (and only the settlement) that can make a claim under the Outer Space Treaty. No Earth government can claim the land or give it to them. The only thing governments can do (or not do) is pass laws about how their courts should treat sales of Lunar (or Martian) property to their citizens - "recognizing" the legitimacy of the settlement's claim and therefore, the validity of the sale. When I started this debate, some argued that I was wrong about the legality of land claims recognition under the Outer Space Treaty, etc. So Doug Jobes and I took the time to establish an airtight legal case for it. In its winter 2008 edition, SMU Law School's "Journal of Air Law and Commerce" published our article describing land claims recognition in detail and establishing the legal basis for it, complete with 182 footnotes. The Journal is the oldest scholarly periodical in the English language devoted to the legal and economic problems of aviation and space, and is the most prestigious law journal in its field. You can read the article here. For a less legalistic version of how Land Claims Recognition work (and the answers to 25 frequently asked questions) see here. Q. And now Land Claims Recognition has been included in a new law text book? Alan Wasser: Yes! The fact that lunar land claims will now be taught in law schools is an even more convincing demonstration that, though there may always be some dissent, the general legal community seems to have accepted Land Claims Recognition as being fully in accord with existing international law. 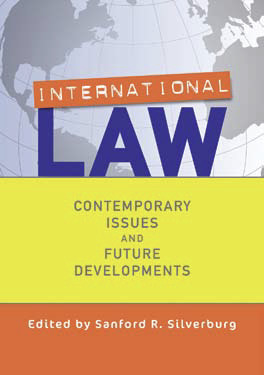 The textbook is from Westview Press: "International Law", Silverburg, ed., (ISBN 978-0-8133-4471-3). "Space Settlements, Property Rights and International Law: Could a Lunar Settlement Claim the Lunar Real Estate It Needs To Survive?" is Chapter 13, pages 275 to 299. Q. When we last spoke, you were marshalling an effort to approach Congress with legislation consistent with your articles. What is the status of your legislation? Alan Wasser: The AIAA Space Colonization Technical Committee (SCTC) recently sent two teams to Congress to lobby for a Land Claims recognition law. They got a good reception but no comittments. It will need much more support from the Space community to actually get introduced and passed, setting off the next space race. Space Business Blog Footnote and full disclosure: Over the last year I have become more and more convinced by the mission of the Space Settlement Institute, so earlier this month I joined their volunteer staff as a policy analyst. When young entrepreneurs talk to me about starting companies – I encourage them to articulate what they want the culture to look like five years from now. Culture is a sneaky thing…it always gets developed. No company lacks a culture, but many lack good ones! Jon, Mike, and Forrest of Altius Space Machines stopped by my house after their successful Zero-G flight. I only got a few hours with them, but I did get to see (and touch) their current "Sticky Boom" prototype. Below is my pencast (from LiveScribe) based on conversations with Altius founder, Jon Goff. And for those that missed it, here is ASM's highlights from Saturday's Zero-G flight. NASA has released a 40-page Commercial Crew/Cargo Market Assessment for Low Earth Orbit. RLV News pointed me to the softcopy – thanks Clark. Here is NASA’s summary of the next ten years of projected commercial demand for cargo and crew to Low Earth Orbit (LEO) with commercial demand ranging from 7K-60K lbs of cargo and from 44 to 360 commercial astronauts. Crew Transportation drives the overall market. Current research on ISS: Basic Research. Over next ten years, ISS research will gradually shift to governments paying for proof of concepts and private ventures pursuing commercialization of successful proof of concepts. But only 9% of all research on ISS to date is “Commercial” in nature – and even this “commercial” research to date has been subsidized by non-commercial sources. The authors relied heavily on industry values to determine the upper end of these markets. The authors never exceeded industry's optimism. The authors in every case established low end demand by extrapolating from history. I look forward to the day when commercial research on orbiting stations far exceeds the current 9%! Overall, a very helpful report (if, perhaps conservative) that will stay on my shelf as a reference. At Last Week's Space Tourism Society’s +10 Dinner, I spoke with two of the founders of XCOR: Aleta Jackson (Co-Founder/Chief Technician), and Dan DeLong (Vice President/Chief Engineer). We discussed general Lynx status, customers, regulation concerns for each flight, XCOR’s preference to fly out of standard airports, etc. And then we changed gears to discuss the Lynx’s “Dorsal pod” intending to ride a top of the Lynx. Here is an image of the Lynx without the Dorsal pod – in tourist configuration (my term). 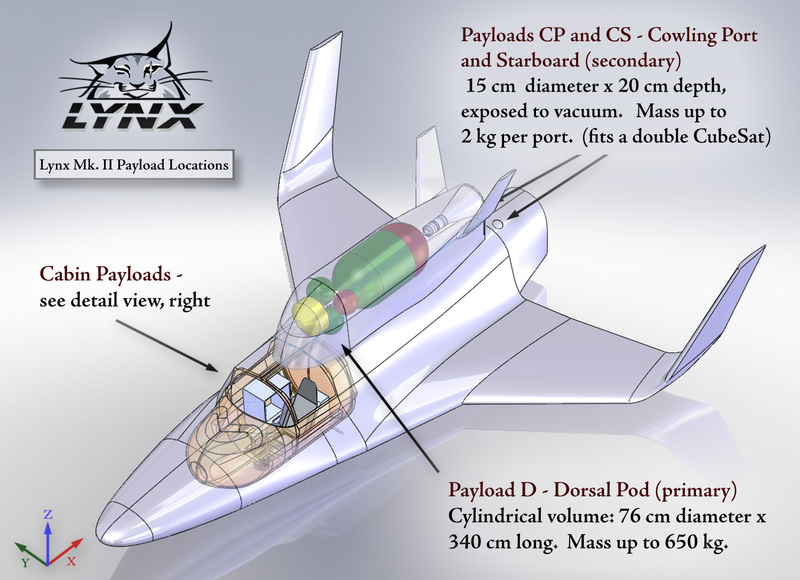 Here is an image of the Lynx with the Dorsal pod on top – in NanoSat configuration (again, my term). 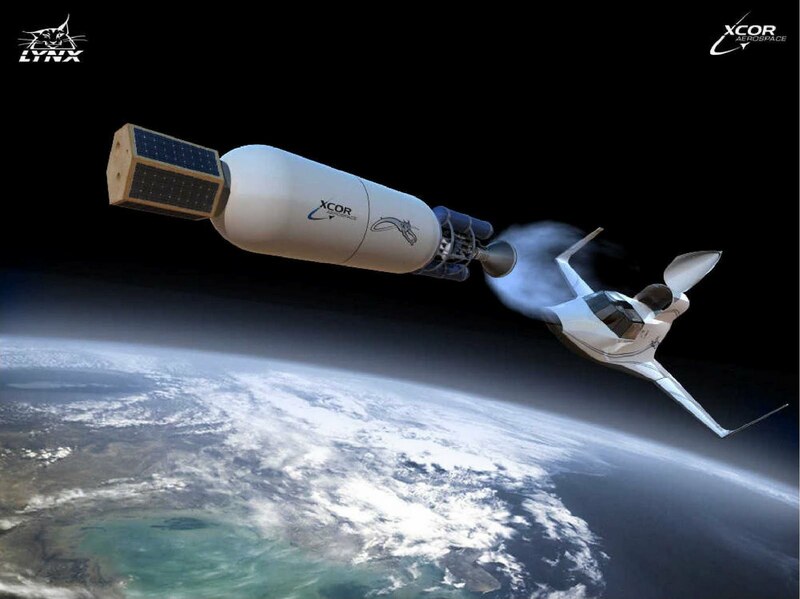 XCOR’s stated plans are to develop an upperstage that can ride inside of the Dorsal pod to launch Nano-Satellites. 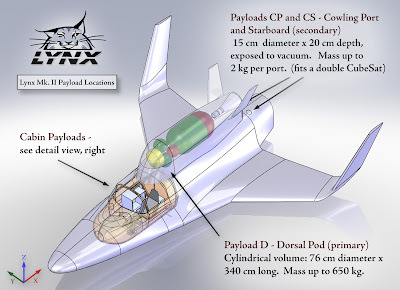 the Lynx would act as a first stage to get to 100km and the upperstage would take the payload to orbit. Here is an XCOR image of an upperstage launching out of the Dorsal Pod carrying a nanosat on board (perhaps my favorite XCOR image ever). Low Time Sensitivity: Traditional NanoSatellites – a delay of a few days/weeks would be frustrating, but par for the course with rocket launches. I have said before how I believe package delivery to station to be a large portion of this “small payload” market because of the frequency of needed launches and ridiculously low integration requirements (how long does it take to load a bag of apples into a “no bruising” canister for launch?). …If I was to build a business to serve the small-payload-to-LEO market, I would want to secure a method to reach LEO as frequently as my customers needed. XCOR through their Lynx/Upperstage vehicle would provide an attractive solution if they can truly fly as often as they say they will be able to. It would not surprise me that, in the end, the market leader will be the company who can fly the most. On Thursday I attended Space Tourism Society +10 event in Los Angeles, CA. Dennis Tito, Space X, Virgin Galactic, 62 Mile Club and others spoke. This was less of a Commercial Space conference for those familiar with the feel of Space Access or Space Frontier Foundation’s NewSpace Conference. Instead this was more of a Dennis Tito-focused celebration of how far space tourism has come over the last ten years and what is to come in the next ten years. Virgin Galactic customers undergoing centrifuge training. The event taking place in LA partially accounts for the diverse attendance list. But when John Spencer, event organizer, gets on the front page of the USA Today (above the fold) talking about Space Tourism, you know Times: they are a-changin. For those close to the New Space community, be ready for "the growing of the tent". For those new to Space Tourism, New Space, Commercial Space, etc. – welcome! I expect over the next years, investor (and customer) interest in the sector will continue grow at the expense of that “family reunion” feeling we get at current new space gatherings. This is healthy: the family is growing into an industry. And it looks like an industry more and more each day. The Space Tourism Society’s +10 even is only the latest indication.